Sold by Jake Auerbach Films and Fulfilled by Amazon. Gift-wrap available. Sold by Jake Auerbach Films and sent from Amazon Fulfillment. It s about instinct, temperaments and practicalities, about perseverance. About how work occurs and how, from working life to working life, art is passed on. Although the starving artist in the garret is no longer the favourite public stereotype, painters and sculptors remain something of a mystery even to those who spend time looking at their work. 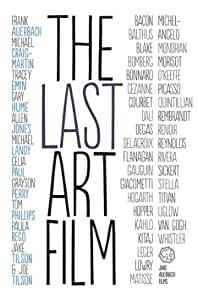 So a film that helps to explain their assorted motivations can only be a good thing, and one as lucid and entertaining as Jake Auerbach s latest offering, The Last Art Film (available on DVD at £16.99), should be welcomed with open hearts and minds. Jake Auerbach is a distinguished film-maker with a string of successful artist documentaries behind him (his subjects have included Sickert, Freud, his father Frank and Allen Jones), and he has distilled all his experience of the strange ways of artists into this 94-minute film. It is thematically arranged, exploring the practicalities of art training and studio practice, juxtaposing interviews with various living artists (Tom Phillips, Michael Craig-Martin, Grayson Perry, Tracey Emin, Joe Tilson and his son Jake, Gary Hume, Celia Paul) with quotes from the dead great (Delacroix, Degas, Matisse, Titian, Gauguin). The film fruitfully explores how different artists are from other people and what it is they actually do, without arriving at any restrictive conclusions. Networks of friendship and influence emerge: Frank Auerbach taught Tom Phillips, Craig-Martin taught Hume. Paula Rego recalls getting bad advice from Victor Pasmore and encouragement from Lowry; her own advice is just keep at it don t give up . But in the end, the mystery remains. As Picasso said: Painting makes me do what it wants. All Jake Auerbach's films are wonderful. Sympathetically made, allowing the artists to speak about themselves and other artists and their work. From the first picture and the first note of (the beautifully chosen) music, we are in another world. What strikes me is the humility of the artists (not quite so evident in the sculptors in "Rodin", I have to admit...) and the good sense they speak. I've watched all the films now and would heartily recommend them to anyone, both as films about artists and as films in their own right. These videos by Jake Auerbach are like the Alan Bennett Talking Head series where you feel that you are sitting in the room with the speaker. As a somewhat aged novice artist wrestling with my pencil etc this is a superb tonic on the bad days when you begin to wonder if you will ever move forward. The problem with this film is mainly the sound. I expected a film made by a professional instead it sounds like a home movie! There is an abundance of artists talking but frankly very few have anything of importance to say. One glaring exception is Frank Auerbach which shows his true passion about art and his approach to it. A very rare treat. It's almost worth the price of this video! Overall a disappointing film and I am a person who has bought other videos made by Jake Auerbach and liked them. 3.0 out of 5 starsNo Subtitles, Grr! I bought this as a gift and the recipient is very pleased. However, when we tried to watch it together we discovered there are no subtitles so I could not follow the dialogue, being hard of hearing. Why no subtitles? Do they think the deaf and hard of hearing are uninterested in art? Very special. Excellent in identifying and exploring its subjects. Illuminating, richly informative and in many ways, entertaining. A good resource for building a rounded and complete sense of these remarkable artists.